• Why your strengths aren't "what you are good at" and your weaknesses aren't "what you are bad at." • How to use the four telltale signs to identify your strengths. • The simple steps you can take each week to push your time at work toward those activities that strengthen you, and how to cut out those that don't. • How to talk to your boss and your colleagues about your strengths without sounding like you're bragging, and your weaknesses without sounding like you're whining. • The fifteen-minute weekly ritual that will keep you on your strengths path for your entire career. As part of the program you'll take an online Strength Engagement Track, a powerful gauge to measure the level of engagement of your or your team's strengths. Go Put Your Strengths to Work will open up exciting uncharted territory for you and your organization. Join the strengths movement, and thrive. Please note: As of 2014, the Strength Engagement Track or (SET) tool referred to in Go Put Your Strengths to Work is no longer available. The SET code provided in this audiobook has been automatically upgraded to provide access to Marcus Buckingham’s newest strengths assessment, StandOut. To take the StandOut assessment, please go to StandOut.tmbc.com, click "Join Now" and enter your code. Please disregard directives for the Strength Engagement Track or SET tool throughout the program. The book appears to be excellent but is based around a SET Score that is no longer available, rendering the advice in the book good, but not specific because you cannot apply it accurately. The code booklet states the SET tool in no longer available and the code automatically upgrades to the newest strengths assessment, Standout. It is a good assessment tool. No complaints there but I would like to see the SET Score because that is what the book keeps referring to. At the website standout.tmbc.com it states; "For a limited time, we are making the new StandOut assessment available free of charge to purchasers of Go Put Your Strengths to Work," but it takes a ten digit key and in my book the key is only eight digits. I'm left feeling ripped off and am having trouble enjoying what is obviously a good book. Every time I go to read it I get irritated about the code situations and keep putting it to the side. I have sent two emails now to see if I am misunderstanding something. Second one today because I didn't see a reply to the first one. SET test, now 'Standout', is worthless. 'StandOut doesn't tell you anything new about yourself, or what careers you might be suitied for. and before you swipe your card, it pays to be snarky and honestly ask yourself what you'd like to gain from this book before buying. Do you honestly believe it's more likely that some self-proclaimed management guru holds in his hands the next key insight you need for skyrocketing your career and it's unlock-able by only a 10 minute spiritual journey in the form of just 35 questions, OR is it more likely that generations of economic models are right-- Capitalism still works, and as long as there's profit to be milked, someone, somewhere is gonna juice the Strength's movement for all it's worth, even if it means getting an intern to code a basic survey page, gloss up a 13 page results page that restates everything more times than a daft punk song, all for one easy payment of 10 bucks? Your call. So many books that in any way come close to being in the "positive attitude" arena contain more fluff than fact, more hype than action. Knowing Marcus Buckingham's earlier works, one should know that his work is backed by solid research, in some cases, some of the best research ever done, i.e, the Gallup background in "First, Break All the Rules." In this case, while Marcus relies on interviews with individuals, it's the consolidation of the material that makes it so powerful. The book takes the ideas of knowing your strengths to the next steps for implementation and action. What is particularly interesting about this book is that it is clearly a 21st Century publication, at an expected competitive price. The book contains a code that allows the reader to access a brief assessment tied to the basic content of the book, an opportunity to watch segments of the companion film, Trombone Player Wanted, and the essential forms for implementing the concepts. So instead of having to purchase a separate workbook, it's all included. For that plus the excellent content, I say thank you. It's not a short book, but it was engaging enough that I did it in short segments over two days. 5つ星のうち5.0Helped Me to See Life in a Wiser, Healthier Way! 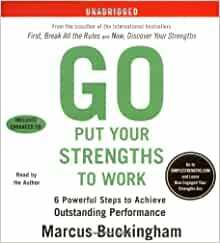 Marcus Buckingham's book, "Go, Put Your Strengths to Work" was my introduction to what is being called "the strengths movement." And what an introduction! This book has had a profound impact on my life, as I'll explain a little later. I highly recommend it as a powerful book to change your life for the better. The idea at the center of the strengths movement is that excellence is not the opposite of failure and that, therefore, you will learn little about excellence from studying failure. The action based on this belief is that we should focus on finding and employing our strengths in life because doing so will make us more creative and happier, and better at what we do. To reach this goal, we need to assess our lives and jobs and discover how well they are allowing us to use our strengths. Surprisingly, most people are already at jobs that can allow them to maximize their strengths. The trick is to look at what you currently do and to increase dramatically how much of the time in your life you're actually playing to your strengths: in other words, see if you can restructure your life and job around your strengths. The "AHA" Moment for me came near the beginning of the book as Buckingham discussed why it was that so many of us are still drawn to learning the things we lack or are not good at. In the process of reading "Go, Put Your Strengths to Work" I discovered that too often I focus on and complain about what I don't have and what I'm not instead of seeing and giving thanks for what I do have and what God has made me. A corollary to this is that instead of going to bed late thinking I've never done enough for God or my neighbor, I can go to be even if things are left undone. This was very liberating to me! Buckingham astounded me even further when he wrote that it was a myth that as you grow, your personality changes. The truth, instead, is that "As you grow, you become more of who you already are." This is exactly what I've found to be true in my life and the lives of countless others, and yet the ideas in my head didn't match up to what I was witnessing. This is not to deny the reality of true spiritual change. But your basic personality is not what really changes in a spiritual change: just the way that you choose to use what God has already given you. 1. How does it serve you to believe that as you grow your personality changes? 2. What would it cost you to stop believing this? 3. How would it benefit you more to believe that as you grow, you become more of who you are? As I answered these questions, a great deal of stored up wisdom flowed from my heart to my head to my hand as I wrote down my answers. These are 3 profound questions that can be applied to many important areas of life, and they helped me to realize a lot of important things about myself. I found myself, for example, measuring my "success" in a new and healthier way. The remainder of the book works out the ideas I've already summarized above, especially the 6-Step Discipline. I believe this book has the power to cause you to examine your life and to, in turn, live a life that is wiser, healthier, and happier - not just on a material but also on a spiritual level. This book helped me put into words and prospective, the strongest areas of myself. It was wonderful. It takes you through 64 human strengths, and through some tests gives you your TOP 5 strengths first, and then the rest in descending order. I carry around my top 5 on a small index card in my wallet. The CEO of my company advises me often, to USE them in my everyday life, and see how it makes me grow. I would recommend this book to anyone who is searching for answers about themselves.